Over 3,500 singers are coming together to lead a chorus of amateur voices in a mass sing-along to remember the Manchester Arena attack victims.Twenty-two people died and hundreds injured when a bomb was detonated outside a concert on 22 May 2017.Manchester Together in Albert Square will feature songs by Elbow and Oasis.It follows a memorial service at Manchester Cathedral, which saw Prince William join political leaders and the families of the victims to remember. Gina and Casey Hankey, from Stoke, said they were at the arena. "We did the arena visits, so this is another step. The atmosphere has been good so far, but it's still a bit sad. 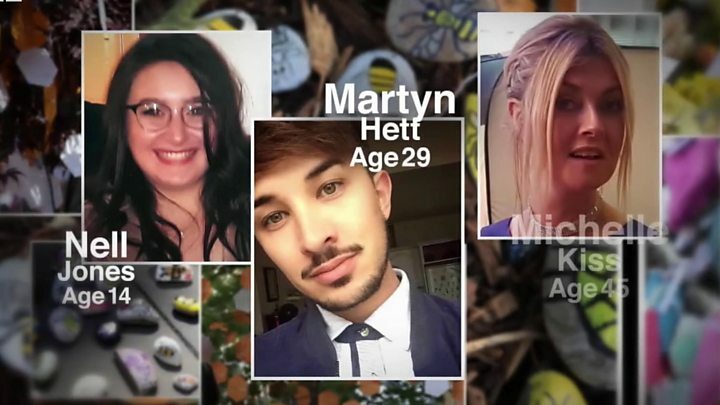 "Rachel and Mia, from Bolton, said they had come "to show we won't be beaten and show you carry on and remember those who died".Julie, from Eccles, who came with her son Louis, said they wanted "to pay our respects as it just touched everybody". The sing-along will see performances from 10 singing groups, including the Manchester Survivors Choir and the Parrs Wood High School Harmony Group.The former is made up of people who were caught up the attack last year, while the latter saw their post-attack tribute - a version of Ariana Grande's My Everything - go viral and earn them the chance to perform with the star at the One Love Manchester concert. 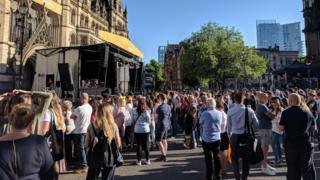 That concert was held two weeks after the homemade device was detonated outside Grande's concert.Cath Hill, who is in Manchester Survivors' Choir, said while they had "been through something really difficult", the group had wanted to "stand up and rise up and show everybody that we are carrying on".The two-hour event will conclude with a mass sing-along of four songs - Grande's One Last Time, Elbow's One Day Like This, Take That's Never Forget and Oasis' Don't Look Back In Anger.That final song became an anthem of defiance in the aftermath of the attack and was sung by a crowd in Manchester's St Ann's Square following a minute's silence on 25 May 2017.St Ann's Square was also be where the majority of tributes were left following the attack and will be the scene of the last part of the city's day of remembrance.From 21:30 BST, song lyrics chosen by members of the public will be projected onto its pavements and buildings.You can view special coverage of the "Manchester Together" commemoration event between 19:00 and 21:00 BST on the BBC news channel or via the BBC News website.